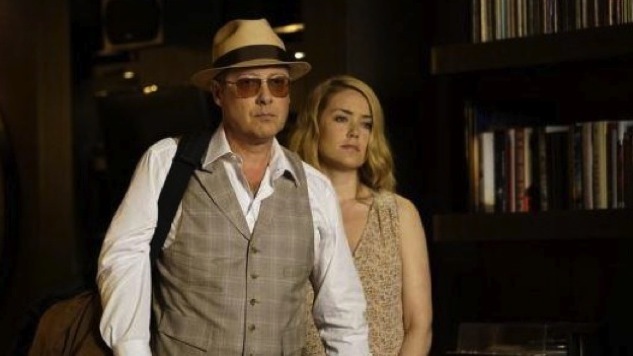 The Blacklist Review: "Eli Matchett"
Last week’s surprisingly good episode of The Blacklist ended with a message of hope, not just for Elizabeth Keen and Raymond Reddington, but for the series in general. Running away from the FBI, Keen and Reddington jumped on a boat, seemingly to open waters where they could exonerate themselves. Who knew where and what these two would get in to with all that freedom and determination? What wondrous places could Keen and Reddington go to in their newest journey?! Iowa. They could go to Iowa. Apparently right after we left them in last week’s episode, they turned that boat right around and headed straight to the midwestern state. This is emblematic of what The Blacklist always does: it gives the illusion that change and a great new direction is right around the corner, and then immediately makes a U-turn and heads right back onto its usual, bland path. Keen and Red head to Iowa because of Verdiant Industries, the world’s largest agricultural company which sells genetically engineered seeds, and just so happens to be a money laundering setup for the cabal. A renegade group of small farmers has broken into Verdant to steal billions of dollars worth of data, as well as a virus—created by Eli Matchett—that would infect all of the genetically engineered seeds. But all that really matters is that Reddington knows if he can get the data, he’ll have leverage over Verdant, therefore having leverage over the cabal. Meanwhile, Ressler has to now stop the spread of this virus, along with Reddington and Keen. As I’ve said many times, the biggest problem with this crime-of-the-week structure on The Blacklist is that it makes the majority of the episode feel completely unnecessary. We get some slight information we need in the beginning and in the end, with the rest just feeling like filler. This is what happens with “Eli Matchett,” where all that really matters occurs in the last few minutes, with Reddington finally on the offensive, telling Verdiant’s CTO that he is coming for the cabal and he wants them to exonerate Keen. That’s it. That’s all that matters. Because Ressler is now only a few steps behind Reddington and Keen, not only do we get plenty of exposition, but we get that exposition TWICE! In case you can’t get enough of that hot seed talk, get ready to hear it multiple times! I also mentioned last week that Reddington and Keen running away should push their relationship further, beyond her just trying to find information. In “Eli Matchett” however, Keen has become completely enamored with Red and his ways, to the point that she’s constantly and embarrassingly in awe of him. She can’t get enough of his pointless stories about the random weirdos he knows, and it blows her freaking mind whenever he finds something hidden in an air duct, or figures out the code to a locked door. She’s no longer curious and suspicious of Reddington, she’s gone into complete fangirl mode. Not only do the first and last few minutes of “Eli Matchett” end up being the only moments that really matter for Reddington and Keen, but it’s the same for the rest of the cast as well. Tom keeps going to the same restaurant hoping that Keen will contact him—which never happens—until Harold Cooper walks in with a Karakurt folder, saying he has a job for Tom. If I can guess what’ll happen, Tom’s actions will find Karakurt, exonerating Keen and bringing Tom and Keen closer together once again. Also, “Eli Matchett” is the first time Reddington realizes that Dembe—who is usually always by his side—hasn’t been heard from in quite some time. Probably because he’s been captured and is being tortured. The one shining glimmer of hope throughout “Eli Matchett,” though, is that Dembe is now being held with Paul Reubens’ Mr Vargas, one of the The Blacklist’s most fun recurring characters. “Eli Matchett” is a huge disappointment, considering where last week’s episode seemed to be heading, but it shouldn’t actually be a surprise. Maybe one day The Blacklist will make a change in the right direction without turning right back around, but this week just isn’t that week.